Dell made a cool $1 million over the holidays by alerting Twitter users to sale items. Now Felipe Coimbra, the developer who gave us twtpoll, twttrip and twtvite, is launching twtQpon, a Twitter coupon creator for businesses to roll out their Twitter marketing strategy. Not a bad idea, when retailers are trying desperately to find a way to harness the outreach power of Twitter. Others retail operations are following Dell’s lead by using Twitter to spread the word on sales and discounts. CheapTweet.com even breaks down all these sales by product. 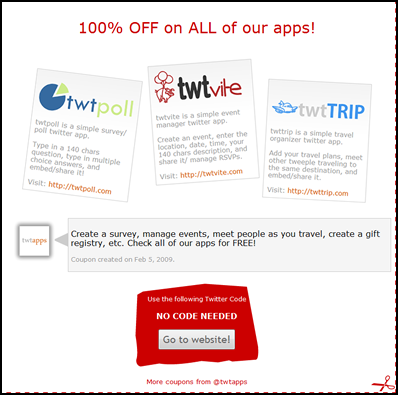 You create an coupon on the twtQpon site, and then, like the developer’s other apps, micro-message with a tiny URL on Twitter or Facebook. The link takes people to back to the advertised website to redeem the coupon.